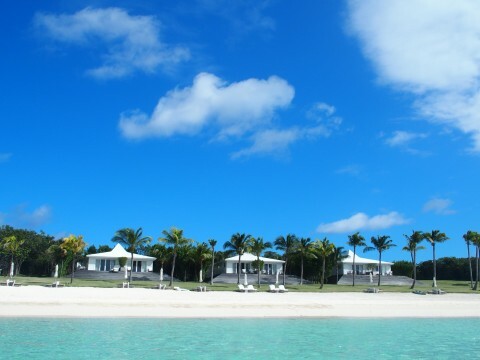 For newcomers booking a vacation at The Cove resort on the island of Eleuthera, it’s reassuring to know there’s an airport friend waiting to whisk you to this posh Caribbean retreat. This Cove ambassador could be Jerome, it could be McNeal, or it could be Trish. You won’t realize it at the time, but this Bahamian guide is on a personal mission to win you over. These Cove team members are as passionate about their workplace as they are about the 110-mile long island of Eleuthera. The reason for this exuberance is obvious once you gaze beyond The Cove’s pearl-white welcome area. Once Jerome, McNeal, or Trish motor you by golf cart to your luxurious vacation accommodations, you’ll be handed a Bahama Mama cocktail to quench your thirst. This refreshing beverage is the perfect elixir for an inital glimpse of The Cove’s oasis of palm trees, hammocks, restaurants, and 57 whitewashed bungalow suites. After you’ve been at the resort a moment, you’ll realize that you’re keeping time with the palm fronds swaying to the ocean breeze. This tradewind tempo, aided by another long sip of rum, releases any stress you held just hours before. You’ll find yourself thrilled by the awesome views surrounding your new accommodations. Before The Cove ambassador departs, he’ll say, “If you need anything, just call.” That’s when you observe, for the first time, that The Cove exudes a one-of-a-kind Caribbean-style luxury. Once you’ve unpacked, unwound, and pondered how to take advantage of all The Cove has to offer, that’s when the real fun begins. 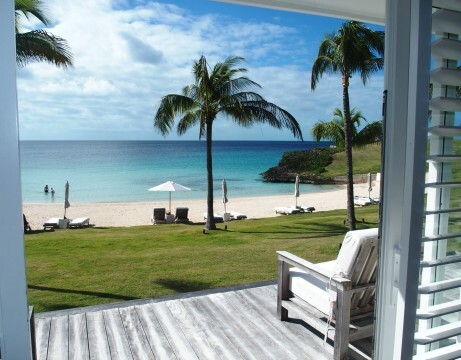 Open the bungalow sliding door to your first full day of Caribbean “wow” images. The best part is knowing this color-splashed awakening is on call throughout your vacation. Your first day at The Cove is when “turquoise sea” becomes your new favorite color. The Cove is blessed with not one, but two crescent-shaped beaches. What magnifies the beauty of these white sand marvels are the dual peninsulas separating the beaches and flanking the north beach right side. These “points” offer high-resolution photo opportunities, as well as intimate settings for enjoying an ice cold drink, reading a novel, or celebrating your connection with the Caribbean Sea. 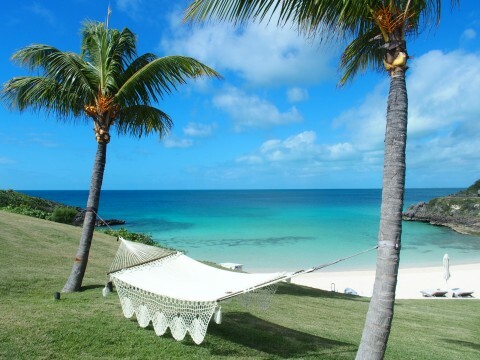 After a day of snorkeling, paddle-boarding, kayaking, checking out the rest of Eleuthera in your rental car, or simply relaxing on the beach, The Cove’s enclave of guests shift to the infinity pool, or along the north beach, to experience an all-natural dazzler in the sky. 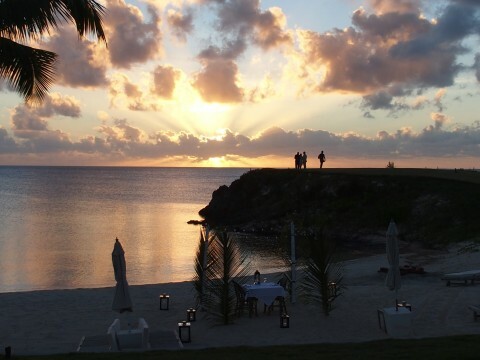 The Cove is home to one of the best sunset vantage points in all of Eleuthera. Nearly once per week, as the sun goes down, lucky couples exchange vows on The Cove’s northern point. Guests gathering for the sunset are met with a tantalizing win-win decision. Do we focus on the gorgeous array of colors flashing on the horizon, or the figurine-sized couple and minister standing at the north point peak? 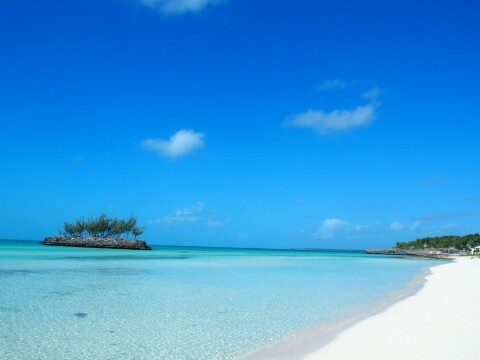 One reason guests choose The Cove and Eleuthera is because this friendly island is still under the radar. To collect seashells on a beautiful white sand beach and realize you’re all by yourself is a thrill, especially in this social media connected world. It’s only a matter of time that this before the masses experience is a thing of the past. The Cove team is passionate about sharing tips on which Eleuthera outpost to explore if you wish to maximize your vacation time. Cove breakfasts, lunches, and dinners are positioned for exquisite ocean views. 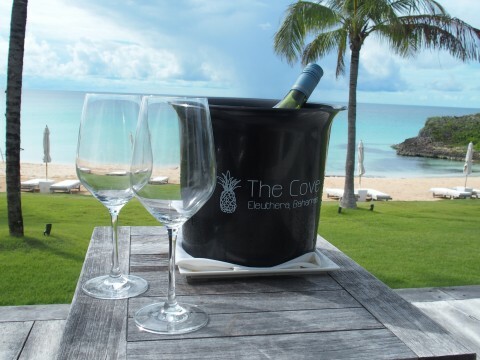 If you wish to create a special Caribbean beach dining experience, then The Cove has got you covered. Request that a boating guide takes you fishing, and then prepares your catch on the beach. If romance is on your mind, then imagine a dinner for two under the stars. 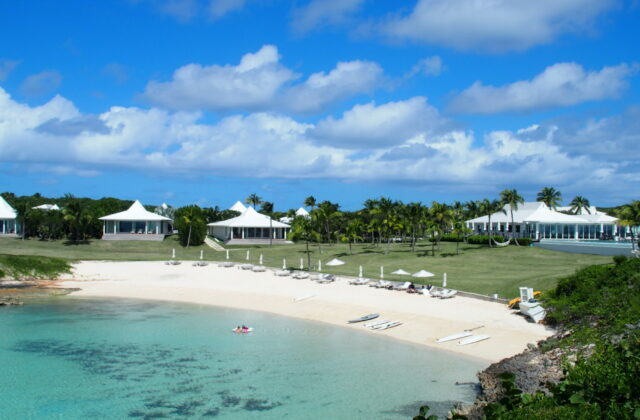 The Cove luxury resort goes out of its way to create intimate island memories. 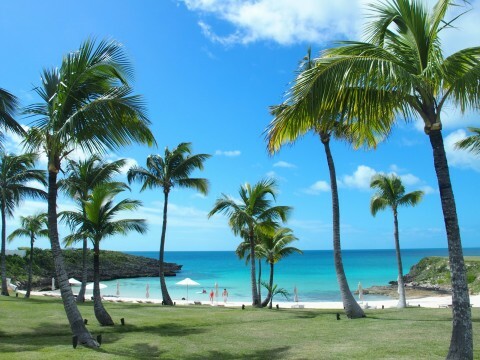 If daytime is beach time at The Cove, then the evening hours are like Christmas in the Caribbean. 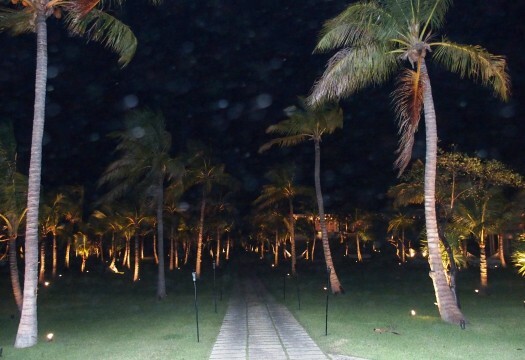 Each evening, The Cove’s courtyard and palm trees come alive with lights. This contrast of jet black sky, illuminated palm trees, and the sound of ocean waves delivers an ambiance that is truly unforgettable. Your island vacation at The Cove will come full circle when you return to the North Eleuthera airport. Chances are good that the person chauffeuring you home is the same individual who welcomed you to The Cove on day one. Their inquiries with regards to your vacation expectations are genuine, as are the hopes that you’ll return to Eleuthera. When you arrived at The Cove a week before, the person driving you was an employee. When you shake this person’s hand at the airport, you’re bidding farewell to a friend.